The .NET Foundation is an independent organization created to foster innovation, which we believe starts with open development and collaboration. It's also a forum for community and commercial developers to broaden and strengthen the future of the .NET ecosystem. The .NET Foundation supports .NET open source in a number of ways. Promote the broad spectrum of software available to .NET developers through NuGet.org, GitHub, and other venues. Advocate for the needs of .NET open source developers in the community. Evangelize the benefits of the .NET platform to a wider community of developers. Promote the benefits of the open source model to developers already using .NET. Offer administrative support for a number of .NET open source projects. The .NET Foundation provides several services to support the projects in our community. If you 're currently running a project along these lines, or if you 're interested in kicking off a new idea, please take a look at our New Project Checklist. New projects joining us will get mentorship on how to best run an open source community along with access to developers currently seeking .NET projects. We work with project leads to help ensure the project grows into a vibrant and welcoming community. And of course, we love to share best practices for managing a friendly, collaborative, and innovative open source workplace, wherever you may be. Legal can be tricky. We can help. Projects in our organization will get assistance to organize and manage their IP assignments as well as infrastructure for tracking common, simple, Contribution License Agreements across all .NET Foundation projects. We can also help ensure that your collaborators respect the open source licenses and trademarks of projects assigned to the .NET Foundation. Need advice on legal issues? We offer support there as well. The more people who know about .NET, the better for the ecosystem. We work with Microsoft and other industry leaders to improve your project 's exposure within the community at large. Your success is our success-we'd love to see you achieve the accolades you deserve! While we do not provide grants or funding for projects, we can help you accept, invoice, and process in-kind donations or those earmarked for donation on behalf of the individual projects. As a U.S. tax-exempt non-profit organization (501. (c)(6)), there are some limits to what we can do to support you from a financial perspective, but let's make sure your funds are spent and allocated appropriately. When running events such as meet-ups and conferences, the foundation can also work with projects to create ticket selling accounts, arrange contracts with venues, and more to make sure you have what you need. Donations typically cover relevant activities including hosting expenses, travel expenses, promotional items, sponsorships, and more. We provide support services for our projects including Authenticode code-signing of binaries and installers, binary distribution management, forums, hosting, shared secret storage, online and phone conferencing as well as document collaboration facilities and access to software. Our automated CLA system has been working well for GitHub-based projects, with a very high rate of developers able to easily sign their Contribution License Agreements electronically. This service is offered with full automated notification to the project committers regarding the CLA status of a pull request author. Get a secure vault to store secrets related to your project (social media credentials, website logins, etc.). Share credentials securely between trusted maintainers on your project, or simply enjoy the peace of mind that they're safely saved. We've partnered with DigiCert to provide SSL certificates for the .NET Foundation OU. We set your project up in Digicert's system, you request the certificate for your website, and they're paid for centrally by the foundation. We've implemented an automated service to Authenticode signing your release MSIs, EXEs and Nuget Packages with the .NET Foundation code signing certificate. The certificate is well known to Windows Smart Screen, so people can install your open-source application without warnings. It also allows for consuming applications knowing that the binary downloaded is the one created on your build server. We provide hosting for a number of .NET Foundation project resources in Microsoft Azure. We have a .NET Foundation Office 365 account with SharePoint Online, Exchange, and more. If your maintainers need access to certain software to enable them to work more effectively on their open source projects, contact us and we can talk with vendors on your behalf. 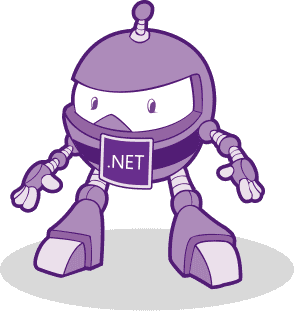 Microsoft has sponsored a number of MSDN subscriptions for .NET Foundation project contributors over the past 12 months. We use Discourse for our forums, and we can also set up dedicated, project-specific forums if your project will benefit from it. The .NET Foundation has a Professional FOSS subscription with AppVeyor, which allows projects to access the latest version of Visual Studio and the fastest category of build servers. If you want to have a NuGet feed for your project's CI builds, we have a dedicated MyGet enterprise instance (dotnet.myget.org) with enhanced storage capabilities. Just let us know if you'd like the .NET Foundation to safeguard your project domain names or assist with DNS configuration. That's the bulk of what we offer, but who knows what might come up? We're always looking to expand our list of offerings to help you get your project done with the fewest hurdles. If there is anything we can do to help your project be more successful, please get in touch. We were designed from the start as an independent forum to foster open development and collaboration across open source technologies for .NET. Our goal is to strengthen the .NET ecosystem through openness, rapid innovation, and community participation. If you get involved, we'll help you stay focused on producing high-quality software without the legal and administrative distractions and overhead. Keep your eye on the code and your users! We certainly don't discourage it! Absolutely feel free to join any foundation you prefer. We will even happily facilitate those connections when we can. We are special in that we're the only foundation to focus exclusively on .NET. That means we can keep our focus narrow, and that our community shares the same skills, tools, and environments-so it's a good filter to know what you're getting. The .NET Foundation is license-agnostic. Projects that come to the Foundation are free to choose any open source license, as defined by the Open Source Initiative. However, we do NOT believe that making software available under an open source license is sufficient. We expect our projects to accept contributions from the community where they clearly align with the project strategy. It's incredibly important to have a clear governance model that describes how individuals and organizations can engage with a project. This ensures transparency, which is fundamental to our beliefs. The .NET Foundation does not prescribe a governance model for projects. However, we do work with project leads to ensure that they define and document an optimal model that matches the community's objectives. The Technical Steering Group is a working group within the .NET Foundation to provide technical review and coordination across the projects and stakeholders. The Technical Steering Group consists of nominated representatives from the core .NET projects along with representatives from partner companies, organizations, or individuals at the invitation of the Board of Directors. Representation is reviewed annually by the Board to ensure that the right mix of opinions are being sought on the technical direction of .NET. The representatives of the Technical Steering Group are kept informed regarding the ECMA Standardization Process for C# and the Common Language Runtime (CLR), as well as being invited to other events, conferences, and technical meetings. Provide written notification of the names and email addresses of the individual representatives on the Technical Steering Group. Provide written notification of any changes to the individuals representing the organization on the Technical Steering Group. Ensure that their representatives have read and adhere to the .NET Foundation Code of Conduct. Ensure that their representatives engage in discussions on behalf of the organization to help influence the technical decisions being made by core projects in the .NET Foundation and make reasonable attempts to attend conference calls when possible. All feedback and discussion within the Technical Steering Group is provided under the terms of the .NET Foundation Contribution License Agreement. The organization will ensure that their representatives have agreed to the terms of the .NET Foundation Contribution License Agreement or that a Contribution License Agreement is in place between the entity and the .NET Foundation that includes the contributions made by their representatives. I'm Miguel de Icaza, co-founder and CTO of Xamarin and on the board of directors for the .NET Foundation. I have directed the Mono project since its creation in 2001 and oversaw the launches of Mono's desktop, server and mobile offerings at Novell from 2003-2011. Before Mono, I co-founded the GNOME project in 1997. I’m Oren Novotny, Chief Architect, DevOps & Modern Software at BlueMetal, an Insight company. I maintain several popular open source projects, and I am a Microsoft Regional Director & MVP. I'm Jon Galloway, Executive Director of the .NET Foundation. I work closely with the board, advisory council, lawyers and the rest of the team co-ordinating day to day operations of the foundation and help set the direction for the future. I'm Robin Ginn. In my day job I am a Director of Marketing in the Cloud and Enterprise Group at Microsoft. In the .NET Foundation I give a voice to our people and projects, helping build community support for open source and open standards projects across the industry. I hold the pen. I'm Beth Massi, Company Secretary for the .NET Foundation and the .NET Product Marketing Manager at Microsoft. I'm focusing on community engagement for the .NET Foundation including the infrastructure to support it. I'm Miklos Barkoczi, the Treasurer of the .NET Foundation. I'm the man with the check book. Be nice to me. What's twitter? Software Architect. Ex-Project leader for DotNetNuke open source product and ecosystem. CTO of cryptocurrency exchange Gatecoin Ltd.
Vice President of the .NET Foundation and a former Executive Director. Principal Program Manager at Microsoft. Staff Software Engineer at GitHub, frequent .NET open source contributor. Senior Engineer from Microsoft .NET Framework team helping lead open source initiatives. Senior Engineer from Microsoft ASP.NET Framework team helping lead open source initiatives. .NET Content Creator at Microsoft, Humanitarian Toolbox contributor, author and speaker for .NET technologies.